Even in more developed cities such as Singapore, the rights of a child are no less important, as all children have equal rights, no matter where they live. In fact, this is probably a pertinent issue in our quickly-evolving world, as we struggle with a growing rich-poor gap and a rapidly built-up city with vanishing forests and natural elements. Many times, I compare a child today to that of my own childhood, and even though I wasn’t the most outdoors kid nor very exposed to nature, but I had plenty of free time and space in which to freely imagine and be myself. In contrast, children nowadays tend to be loaded with academic activities and overly-structured contexts, so much so that they lose their own instinctive awareness of themselves and their environments far too early in life. 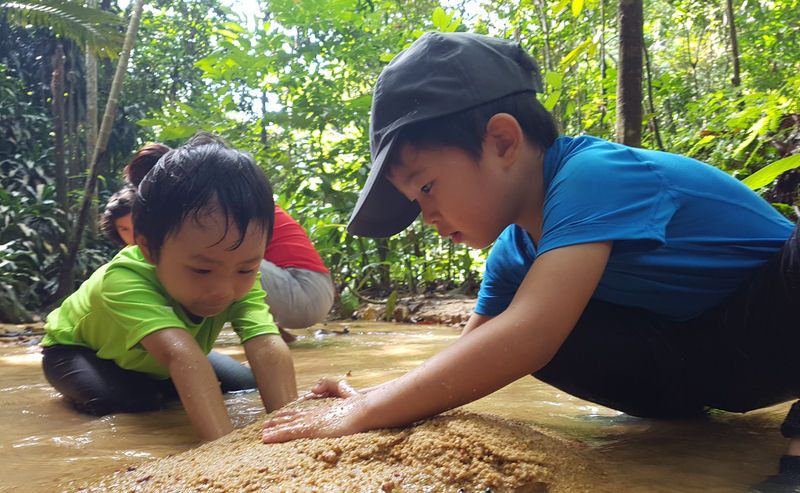 In Forest School, we give a lot of autonomy to the children to explore, lead and even govern themselves and others. Even better, if adults can truly become mere shadows to just observe as they resolve their own issues and decide matters on their own. This is not just a pedagogy, but relates even deeper into the intrinsic rights of each child – to treat them just as equally as a human being capable of having a say and a choice in the matters that affect them. This completely falls within the Convention of the Rights of a Child, and in fact endows them with a deep sense of self-ownership and responsibility that allows them to mature and realise their own importance. I felt this most acutely when in our Forest School sessions, we would always let them decide where to go for the day, and have them all come to a consensus before we set off. Also, before we introduce new children into the group, we seek their consent beforehand. On a few occasions when we came across well-meaning officials who questioned our activities and our perceived rowdiness, we would encourage the staff to directly converse with the kids so that our kids can voice their own opinions and share on their motivations and thoughts. This school of thought could be challenging for most adults to understand at first, no doubt, as kids being kids, they should be disciplined by adults, shouldn’t they? But all we are saying, is to just hear them out, give them a chance to speak for themselves. Children’s rights are not just meant to look pretty in theory – rights are only realised and treated with responsibility when we actually embody them in real life. And this is exactly what we seek to do in Forest School. The total development of a child is so rich and holistic, and giving them rights and responsibility to enable themselves to make their own lives a better place is so much more meaningful, isn’t it?